The sport teaching system in Ciego de Ávila province, besides allowing for the integral and free shaping of 3 372 student-athletes and improving the material conditions for the healthy practice of exercises, perfects its sport schools, where the future national and international champions are shaped. 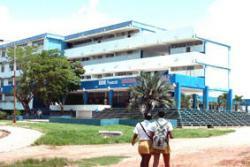 Other links to the chain of facilities in charge of the multifaceted shaping of athletes in this central province are the Physical Education Professors School (PEPS), eight provincial academies and the Faculty of Physical Culture, whose highest registration resides in the university branches located in the 10 municipalities of the territory. The free and mandatory character of teaching in Cuba constitutes the base of its sport pyramid that includes Physical Education in the different levels, from the primary school to the University. As it is habitual in Cuba, the school year began in September. But this time the start was marked by a considerable state investment that has put more material and human resources into the teaching learning process, which endeavour may result in the shaping of better champions.